Attribute is a tab displayed within the Experiment Explorer Window. It features a list of every user-declared attribute within the experiment's List objects, regardless of the List in which it resides. Attributes are typically the major independent and control variables used within the experiment (e.g., condition, stimulus, correct answer). The list of attributes can be sorted in ascending or descending alphabetical order by clicking on the header. Subsequent clicks on the header reverse the order of the sorting (e.g., A to Z, Z to A). 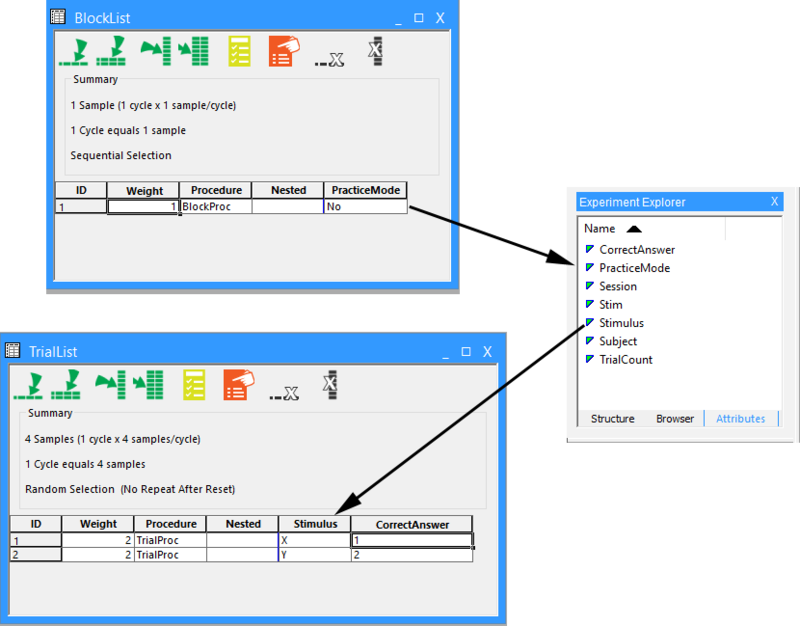 Attributes listed in the Attributes tab can be dragged and dropped to various locations within the experiment (e.g., List object cells, Properties window, fields within object Property pages). When an attribute is dragged and dropped into a cell either in the Properties window or the List object, the attribute name appears enclosed in square brackets, and is displayed in blue. This syntax indicates to E-Studio that the value is variable, and will be resolved at runtime by referring to the named attribute to obtain its current value.